Americans always love a success story, particularly when the hero comes from the ranks of the common man. The entrepreneurs who opened up the logging industry in northern California were not well educated, socially polished, winners of talent contests, or paragons of virtue. They were, for the most part, common men, who believed in success, brushed off failure, and convinced others to buy into their vision. When they failed, they failed forward. Henry "Honest Harry" Meiggs is a case in point. Born in Catskill, New York on July 7, 1811, Henry Meiggs first worked in his father's shipyard, building piers and small boats. Business was good. Before railroads and highways, rivers were America’s main arteries of transportation and commerce..By necessity, America's early colonists lived mainly by water, not deep in the woods or high on the mountaintops. The most important river in America’s early history was the Hudson River, defended by America’s early Revolutionaries, used for commerce, and celebrated by writers and pastoral painters for its beauty. The Hudson River ran for 315 miles from its headwaters in the Adirondacks, through small town America—Saratoga, Catskill, Poughkeepsie, Cornwall, West Point, Yonkers—finally spilling out into the Atlantic Ocean at New York City. Perhaps as inevitably as the Hudson River itself, Meiggs made his way to the big city, fired with dreams and ambition. Before he turned 21, he married Gertrude Burns on April 9, 1832. One year later, on April 12, they had a son, William. Within seven months of William's birth, Meiggs buried his wife. A widower and single father, Meiggs worked as a Manhattan lumber dealer and contractor, managing to amass a moderate fortune within a couple years. The 1830s, however, were a decade of wild financial speculation and spending. Fortunes were made and quickly lost. Meiggs' lumber business was among many that failed. In an age when there were no social programs for unemployment, Meiggs, like others of his generation, turned to family for survival—if they were lucky to have one. Meiggs moved near his married sister in Williamsburg, a town that later became part of Brooklyn, and joined his brother-in-law's lumber business. Henry Meiggs pressed on. On September 7, 1835, Meiggs married a second time to Caroline Doyle. She became at once a new wife and a mother to William, who was not yet 2 ½. Struggling to raise a family, Meiggs would learn that the financial roller-coaster ride was not over. The Panic of 1837 hit New York City on May 10; all banks stopped payment in gold and silver coins. This was the start of a six-year economic depression in which banks failed, unemployment soared, public construction projects halted, and people rioted in the streets of New York City for food. Life goes on, however, even in times of economic or social turmoil. In 1839, Meiggs and Caroline had their first child together, a son, Carroll. He lived about 3 weeks past his second birthday. In 1842, Caroline bore another child, a girl also named Caroline. Little Caroline died 3 months before her own second birthday. Childbirth and childhood were dangerous times in 19th century America. By 1848, having heard about the Gold Rush, Meiggs set his sites for California. However, the 38-year old, Meiggs did not intend to sift California rivers or dig California valleys for gold. Loading a ship, the Albany, with lumber, he set sail for San Francisco with his family in early 1849. His family now included teenager, William; 3 1/2-year old, Henry; and an infant son, Manfred, born September 7, 1848. Considering that the trip to San Francisco went from New York, around Cape Horn, and up the California coast—a trip of almost three months at sea—one can only admire the optimism and stamina of these parents. Stepping off the ship at San Francisco, Meiggs and his wife would have seen muddy streets filled with mules, horses, dogs, canvas tents, blanket tents, makeshift houses and stores, brothels, gambling spots, saloons, and more saloons. There would also have been plenty of noise, muck, and aroma—not a golden city, by any means, except in the opportunities it offered to make quick money. Reportedly Meiggs sold the lumber he brought from New York for twenty times what he paid for it and began his short career as a California businessman. In a little more than a year after coming to San Francisco, however, tragedy struck the Meiggs family again. William died on September 9, 1850, scarcely more than 17 years old. Henry Meiggs pressed on. San Francisco was growing fast and burning faster. Between 1849 and 1851 there were six fires in San Francisco costing millions of dollars in damage. Lumber was needed to build and re-build San Francisco. Meiggs started a lumber business in North Beach, convinced that this area would soon be booming with new homes and stores. Always a salesman and promoter, he invested heavily in North Beach real estate and encouraged new friends and business colleagues to do the same. He bought a sawmill at Bodega Bay and built another at the headlands of Mendocino. In a labor-intensive age, he employed approximately 500 men. Around this time, Meiggs and Caroline had another son, Minor Keith, born October 16, 1852. 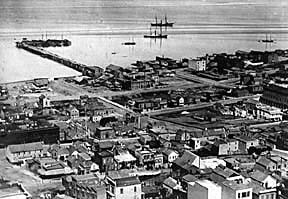 By 1853 Meiggs had also completed Meiggs Wharf, which extended 1600-2000 ft from the base of Powell Street into San Francisco Bay. The photo to the left shows Meiggs Wharf in the 1860s. While Meiggs was making considerable money in his lumber business, he was also spending considerable money on North Beach real estate deals that did not prove as profitable as he had expected. Interest on loans and taxes on property began to mount. With the depression of 1854, Meiggs was faced with huge debts—some estimates put the amount as much as $1,000,000 with the interest alone between $30-40,000 a day (Harker, 196). A San Francisco alderman, Meiggs apparently had access to a book of blank city warrants, already signed by the major and the city comptroller. "Hnoest Harry" forged the warrants and presented them as collateral for his loans. At this point, a melodrama, worthy of any 19th century theater, unfolded. Reportedly, Meiggs skipped town with a "fire burning in the hearth and the birds singing in their cages." Sometime in early October, 1854, Meiggs quietly loaded everything from his San Francisco mansion at Broadway and Montgomery, including vintage wines and $10,000 in gold, onto the ship, American, which, not coincidentally, one would guess, had four small cannons mounted on its deck (Averbuch, 20). In darkness and lifting fog, Meiggs sailed for South America with his family and his brother, John, the newly elected city comptroller of San Francisco. With daylight, angry creditors mounted a search for Meiggs. His creditors included William Tecumseh Sherman, who would prove to be a better Civil War general than a banker. Sherman was a partner in a St. Louis banking firm operating in San Francisco at the northeast corner of Montgomery and Jackson. Of those wild days of financial speculation that brought the ruin of Meiggs and others, Sherman later reminisced: "I can handle a hundred thousand men in battle, and take the City of the Sun, but am afraid to manage a lot in the swamp of San Francisco" (Royster, 133-4). A court subsequently indicted Meiggs for fraud but, in South America, he was quite beyond the reach of California law. Henry Meiggs pressed on. In Chile, Meiggs and Caroline had their last child, Fanny Kip, born October 26, 1856. Despite his detractors, Meiggs wrote to Laura Nelson from Santiago, Chile on September 11, 1859, that "my hopes are still strong, and my spirit uncrushable, notwithstanding what has been said and written of me." On Christmas Day, 1861, Meiggs suffered yet another loss, when his wife died in Santiago. Throwing himself into work, Meiggs constructed, by 1867, about 200 miles of railroad in Chile, much of it along the coast. In 1868 he went to Peru, where there were less than 60 miles of railroad track. With only an elementary school education, quite typical for the times, Meiggs, with the assistance of engineers J.L. Thorndyke and E. Malinowski, built the beginnings of the most important Andean railroad lines still in existence today. 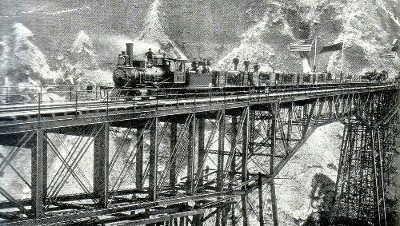 One of them, the Callao-Lima-Oroya railroad, was the highest standard gauge railway in the world, crossing the Andes at about 17,000 ft above sea level. Meiggs would boast “I will lay tracks where llamas walk.” Meiggs imported rail cars from the eastern United States and rails from England. And the railroad ties? California redwood! As a contractor, Meiggs used redwood ties for other Peruvian rail projects as well. Writing about the Oroya Railroad for Scribner's magazine in August, 1877—just a month before Meiggs death on September 30th—J. Eglinton Montgomery lionizes the American entrepreneur, saying that "the Oroya Railroad must take rank in the history of modern engineering as a work of the first magnitude, without a rival" (Montgomery, 462). Henry Meiggs, Kelly House Research Office (Mendocino, CA). 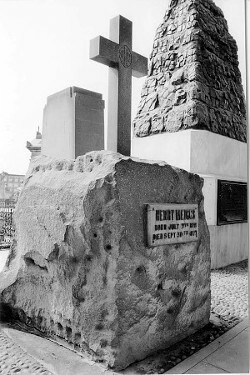 Henry Meiggs Tomb, courtesy of Elio Galessio (Peru). Verrugas Bridge, built by Meiggs and at the time the highest bridge in the world. Photo shows Engine #13, Santo Domingo, c. 1890, with U.S. and Peruvian flags flying, courtesy of Elio Galessio (Peru). Averbuch, Bernard. Crab is King, Mabuhay Publishing Company, 1973. Harker, Mary Margaret. "Honest Harry" Meiggs, California Historical Society Quarterly, Vll. XVII, No. 3 (September 1938). Meiggs, Henry. Copy of a Letter to Laura A. Nelson, 11 September 1859, Kelly House Museum Research Office. Montgomery, J. Eglinton. "A Railroad in the Clouds." Scribner's, Vol. XIV, No. 29 (August 1877). Myers, Elisabaeth P. South America's Yankee Genius. New York: Julian Messner, 1969. Royster, Charles. The Destructive War: William Tecumseh Sherman, Stonewall Jackson, and the Americans, Alfred A. Knopf, 1991.